Examine the history of AI and how machine learning works. Smart machines have been a part of science, and science fiction, for decades. As modern headlines announce the resurgence of artificial intelligence (AI) and the promise of "smart assistants," how might we separate fact from fiction? Learn how software engineers enable "dumb" computers to perform seemingly smart tasks, and the truth behind algorithms and big data. This presentation examines the history of AI, how machine learning works, and enables attendees to make informed decisions about what computing machines know (and don't know). Yong Joseph Bakos is the Seven Peaks Faculty Scholar for Computer Science Innovation for at OSU Cascades, where he leads the computer science program. With a background in both the arts and software engineering, Yong pushes the boundaries of cross-disciplinary research and teaching. 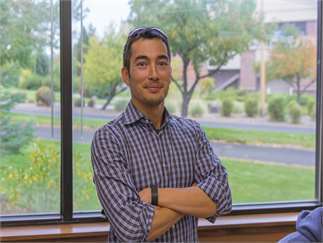 An Ohio native, Bakos previously served as the assistant department head of the Electrical Engineering and Computer Science department at Colorado School of Mines, where he taught for six years. Prior to OSU-Cascades, Bakos helped cultivate the Center of Creative Computation at Southern Methodist University in Dallas. A professional software engineer by trade, Bakos' education is in art theory and practice (B.A., Northwestern University), and software engineering (M.S., Regis University); and he is completing his PhD in Computer Science from Southern Methodist University. His research interests include information-centric networks, software engineering, graphical user interfaces, operating systems, computer science education, and generative art. With over twenty years of experience, Bakos has worked with companies ranging from small startups to Apple. His musicianship has led him through collaborations as an artist and technologist in Chicago, Denver and Dallas, combining live code and music performance.